The Chianti Classico area is one of the most famous wine regions in the world, so it is certainly a must to visit at least one of its towns during your trip around Italy. 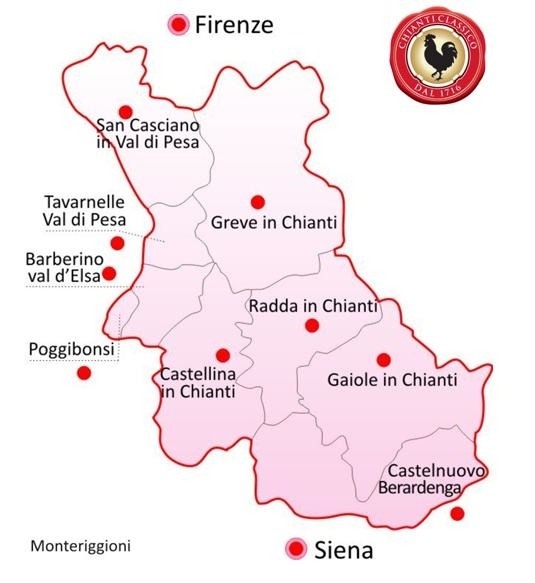 To visit Chianti you have to choose one of two routes: Via Cassia or Via Chiantigiana. In both cases you will find wavy hills and vineyards, white gravel roads, quiet villages, Romanesque chapels, peace and silence. The great Chianti region includes such provinces as Florence, Siena, Arezzo, Pisa, Pistoia and Prato, but the ‘real’ historical Chianti, known as ‘classico’ (English: classical) consists of four villages submerged in hills. Travelling around the enormously beautiful region of Chianti Classico – it is as turning the pages of a marvellous photo album. It seems that behind every corner a more beautiful scenery, a more cosy village bursts into view. 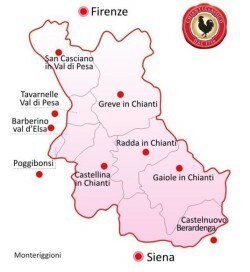 The main towns of the Chianti Classico area are Radda, Greve, Castellina and Gaiole. 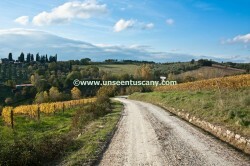 We will tell you about other Chianti towns and Siena environs in our next articles. The graceful Radda in Chianti village, lying deeply hidden in hills, attracts many tourists, wine and nature lovers. Along the devious road leading to Radda in Chianti there are many ‘wine farms’ (Italian: fattoria – literally ‘a farm’) situated, and in green groves you will easily see the roe deer curiously observing tourists. Radda, the capital of the Chianti Classico wine, is situated on a hill between the valleys of Arbia and Pesa. This settlement has been known since the 9th century and it was first mentioned in written documents in 1002. 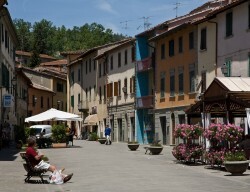 The centre of Radda in Chianti is very small – there is only one street, but there is still much to see. And narrow side streets promise you not only the plenitude of wine-cellars and local food shops, but a lot of surprises (for example an ancient tunnel under dwelling-houses). Noteworthy is Palazzo del Podestà, the palace of the 15th century, with its facade, embellished with the coats of arms of the families that dominated in the area. In the main square you can find the church of San Niccolò and quite nearby there is Ghiacciaia Granducale (English: the Ice House of the Grand Duke) – a special room to store snow and produce ice. 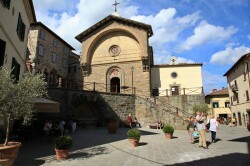 In Franciscan monastery you can visit Museo d’Arte Sacra del Chianti( English: the Museum of Sacred Art of Chianti). 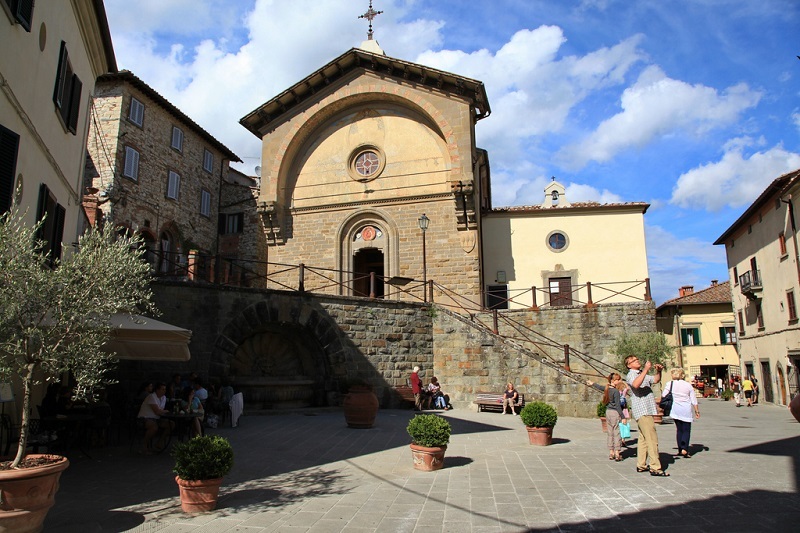 The environs of Radda in Chianti are full of luxurious ancient villas, castles and chapels. One of the most beautiful sights to visit is the perfectly extant medieval castle Castello di Volpaie and the Romanesque church of Santa Maria in Prato. Many Italians call the town of Greve in Chianti as the gateway to the Chianti area. It is situated between Florence and Siena, near the wine road, called Chiantigiana. 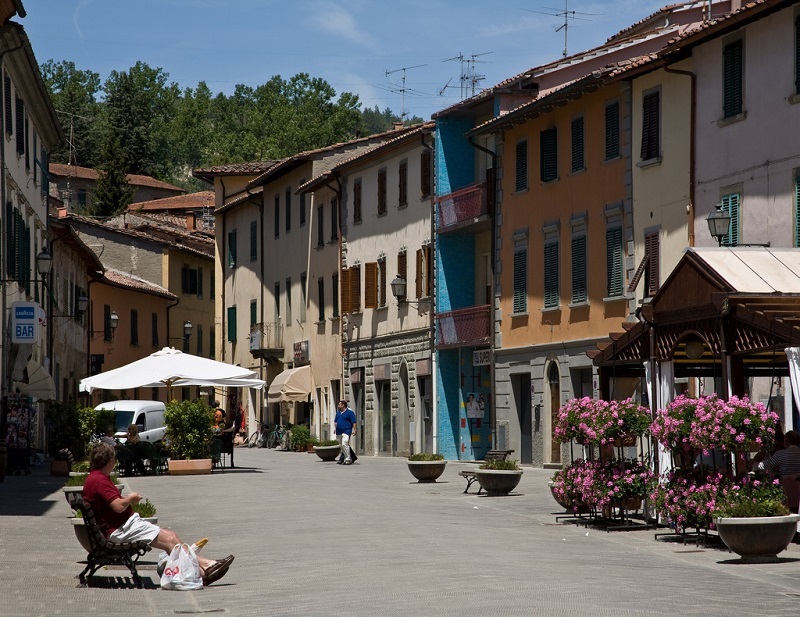 As well as villages and towns in the Chianti area, Greve admires people with its extraordinary atmosphere. The history of Greve in Chianti is inseparable from Castello di Montefioralle (English: the Castle of Montefioralle) that was established in 13th century. 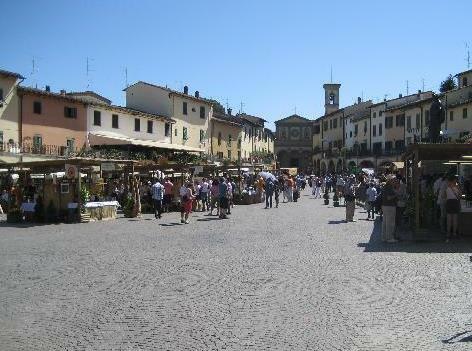 Due to its exclusive geographical position – it is in the crossroads of three particularly important roads (pilgrimage roads, Chiantigiana and roads to Valdarno and Val di Pesa) – the town has grown bigger and a triangular market square appeared in its centre, where, starting from the 16th century, every Saturday a big market of livestock and foodstuff took place. Nowadays, not only markets but also wine tastings and celebrations take place on this same square. One of the most exciting places of the square is Antica Macelleria Falorni (English: The Ancient Falorni Butcher’s Shop), founded in the 1729s and existing even today, selling traditional local pork products. Meanwhile, Bottega dell’Artigianato (English:Crafts Store) specialise in products made in olive wood. There is also the statue of Giovanni da Verrazzano, the famous explorer who discovered the bay in New York. One of the most famous bridges in New York City, connecting Staten Island and Brooklyn, where usually the famous New York City Marathon begins, is named after this eminent Tuscan man. Chianti would not be Chianti if it did not have anything special for wine lovers – Museo del Vino (English: the Wine Museum), where you can taste almost 200 varieties of wine. The museum exposition displays many ancient wine-making tools, as well as 180 different corkscrews. It is equally necessary to visit the charming Montefioralle, the small fortified village, situated near Greve in Chianti, located on the top of a hill, at about 2 kilometres from Greve. It is the birthplace of the famous explorer and discoverer Amerigo Vespucci. One of the houses has the coat of arms with a wasp on its front door – it is a sign of the Vespucci family. It is one of the four historic towns producing Chianti wine, located on atop a hill, between the valleys of Arbia, Elsa and Pesa. The city origins go back to Etruscan times; later it came under the Florentine control and constantly suffered from the battles between Florence and its greatest enemy Siena. Castellina in Chianti, many times destroyed and rebuilt, preserved only a small part of the defensive walls, which are now transformed into the Via delle Volte tunnel, full of shops and restaurants. The main objects of the old centre are Palazzo Banciardi and Palazzo Squarcialupi. Inside the latter palace there is the historic Antiquarius Enoteca (English: the Antique Wine Repository), a shop that stores the very best wines of the region for over a hundred years. You can also visit Museo Archeologico del Chianti (English: the Archaeological Museum of Chianti). And on hot summer afternoons you can refresh yourself at the ice cream parlour Antica Delizia that is proud of its home-made ice cream. Gaiole in Chianti is surrounded by wineries, old villas situated atop on hills and churches, alluding to Romanesque times – that is why Gaiole is attracting tourists. Gaiole has been known for about a thousand years already – traders used to settle down here since ancient, markets used to stretch to the main town square that exists even today. And in the irregular triangle-shaped square you can see a few surviving examples of ancient architecture. But perhaps the most interesting in Gaiole in Chianti vicinities are Pieve di Spaltenna, Castello di Vertine, ancient monasteries, villas and villages surrounded by thick walls. How to travel in Chianti region? • By train. 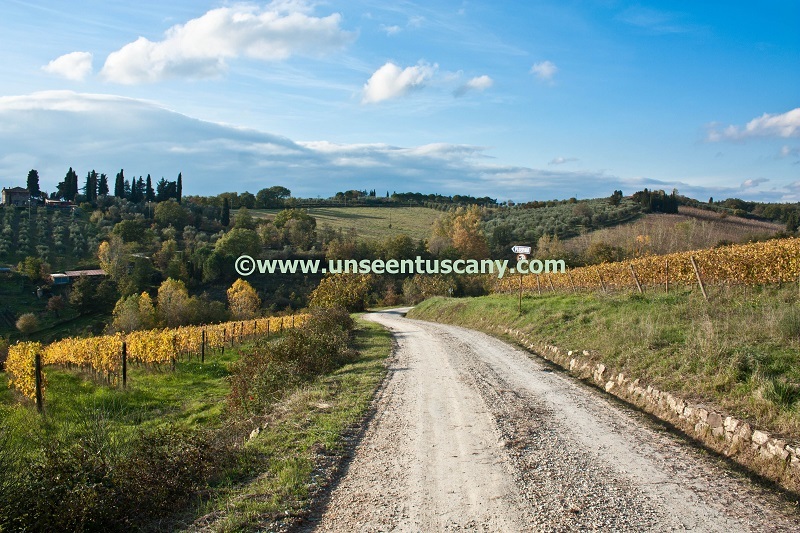 Despite a well developed railway system in Tuscany, getting around the Chianti area is almost impossible. 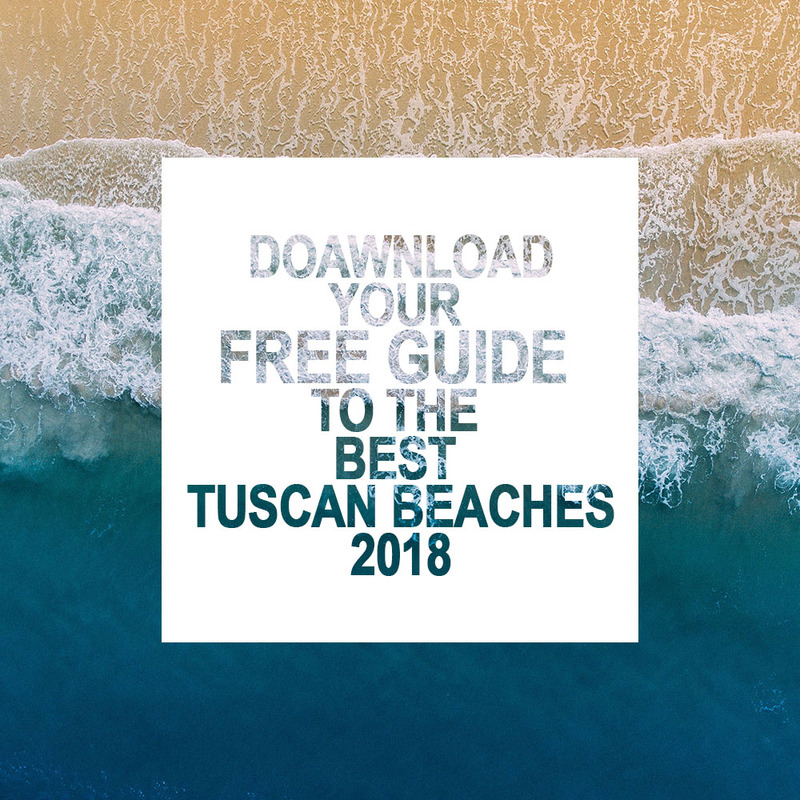 There are only two train stations – Poggibonsi (but if you are heading for one of four towns in Chianti – it is out of the way) and Castellina in Chianti (but the distance to the town is about 12 kilometres). • By bus. If you want to travel by bus in the Chianti area, you will have to travel quite a lot on foot – although buses go to all the Chianti towns, stations are usually located on a hillside, so you simply have to climb on foot to reach the centre. Travelling by bus is not difficult, but it needs a lot of time (especially on weekends it is necessary to study the schedule carefully, because there are only few buses). • By car. 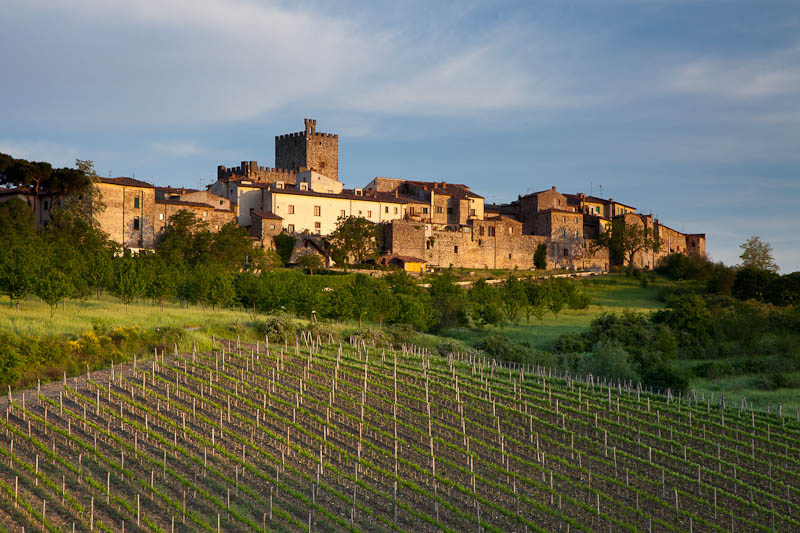 Despite the romance you get when travelling by train or the low ticket price for the bus, moving around by car is the best way to discover Chianti. Only this way it is possible to reach the most remote and most interesting villages and vineyards. Can there be anything more beautiful than a white highway in the shadows of cypress trees when the sun goes down? There are three main roads leading from Florence to the Chianti area: Superstrada Firenze-Siena, Strada Statale (SS) 222 and Strada Statale 2 Cassia. • Together with UnseenTuscany.com. We will plan a trip taking into account your preferences; we will pick you up from the hotel and introduce you to the region, its traditions and food. You will be able to enjoy one or two wine tastings and not to worry about the return to the hotel. A shooting in Chianti hills or in villages breathing antiquity – at your request.